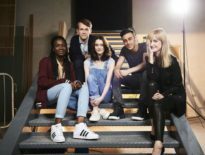 The Doctor Who spin-off, Class, is filming right now, and thus, eager fans have gathered around Cardiff in a bid to see Katherine Kelly and co. – and of course try to get hints of what’s to come when the series airs on BBC Three and BBC1 later this year. Their dedication seems to have paid off. This is your final warning: HERE BE SPOILERS! 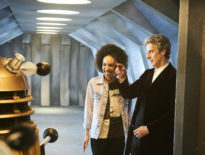 Mind you, this is a spoiler that’s been rumoured for some time: it appears that the Doctor will be dropping in on Coal Hill once more because the TARDIS has been spotted! This is certainly welcome news, as otherwise we’ve got to wait until Christmas to see Peter Capaldi as the Twelfth Doctor again. It’s exactly what fans need to not only see them through these next few months, but also to cement Class as a part of the Doctor Who universe. I'm as excited as you guys trust me. There we have it. Exciting times ahead. Written by Patrick Ness (The Rest Of Us Just Live Here; The Crane Wife), Class also stars Greg Austin, Sophie Hopkins, and Vivian Oparah. If you want to keep up to date with filming, head to twitter and search for #ClassSR. Or just stick with us here at the DWC. Yeah, do the latter one.